This picture is probably my favourite of the year so far. It was taken by Karen Rombouts who has done her internship with us, spending 5 months working and studying for her post graduate diploma. We are so grateful to her for her work and energy and I know she has made huge impact on the way the staff work in the nursery. On behalf of the people in the project I thank her very much for her contribution; she will be sadly missed by both the children and the adults. We wish her good luck for the future and I feel sure she will be back to visit us one day. Looking back over 2009/2010 I realise that we have achieved a great deal – not always what we had planned, but nevertheless we continue to expand and develop. The building has taken up a lot of time, money and energy, but we can see an end to it. I had not foreseen the need for the retaining walls at the front and the back of the property. They are now complete and we can concentrate on the kitchen, which has been delayed, more classrooms and a staffroom. Thank you very much for your kind donations for the building and renovation programme. I hope the majority of the work will be completed by March 2011. Over the last 18 months we have fully completed boundary walls and fences, the driveway, and built a guardhouse at the front. We have installed two large water tanks to harvest rainwater. We have built concrete gullies to direct excess water out of the property and into the storm drains in the road outside. We have installed security lighting and have renovated and furnished three classrooms. We now have more storage for our increasing number of story books and staff materials. We also have a wonderful new play space behind the property which has been given to us by the Chief of Police. Our staff continues to grow, we now have 5 teachers and 3 assistants, a cook and two guards. Thanks to the kindness and generosity of friends, we are supporting several members of staff to further their own education. 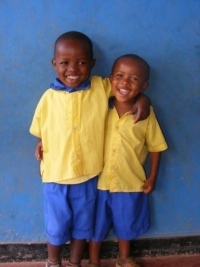 Marthe and Felicie work at the school during the day and go to afternoon/evening classes. Both women began their secondary education before the genocide occurred but lost the opportunity to finish. They now have a new chance. One of our guards, André, is being supported to go to university in the evenings. He is studying for a degree in accounting. Francoise, our cook, is attending cookery school in the evenings. Our adult training programme continues. We have completed the tailoring programme and 90 people have attended classes over 6 months and can now work as tailors. 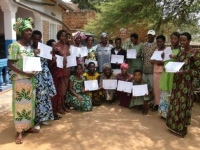 Twenty women attended classes to learn how to make traditional baskets, twenty-four learnt how to make jewellery and eighty people, mainly young women, have attended literacy classes. Our co-operative, formed by thirty members of the tailoring programmes, is slowly building a business, supported by Chris and other volunteers. We have purchased a number of textbooks for most of the classes – basic reading and writing, English, Kinyarwanda, Maths and Social Studies. We have also bought some English picture dictionaries. We will need more for our new Primary 4 class and for the nursery. Our expenditure for the year is shown in the table below. The figures are in Rwandan francs. The value of the pound has varied considerably over the year, but if we take 800 to the pound as an average, it shows that we spent approximately £19,000 pounds last year. For the dollar, if we take 570 to the dollar, that translates into approximately $26,000. The largest expense has been the building and this will be the case for the next year. Thereafter expenses related to the building will be for maintenance and the purchase of the remaining furniture for the last classes and the staffroom. Full details of itemised expenditure are available, please ask if you would like to see them. 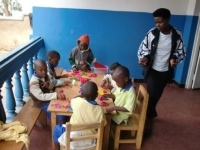 Karen from the USA – known as American Karen or Karen Imwe (one) spent seven months with us working mainly with Primary 2 and 3 on maths and English. Chris, who recently wrote the newsletter ‘a day in the life of a volunteer’ has been working mainly with the co-operative and will be back working with us in the autumn. Bronwen has been working with the nursery children and who is returning in September. Rosas, ran the photography course( which you can read about on our website in the April 2010 news) and also, more recently, an art course. I am hugely grateful for the work of our fabulous volunteers, they contribute so much and I know just how much the children and the staff love their ‘abazungu’ It brings a completely new dimension to their lives. Thank you one and all, your contribution is priceless! And finally there are our fundraisers and supporters here in the UK and elsewhere in the world, busily organising events and talking about us in schools and other organisations. Hundreds of school students and teachers work very hard to raise funds for us. Many groups and individuals support us with specific donations for something or through sponsorship. Thanks are due my lovely sister Kathryn, who manages our finances and Chris who helps with the accounting details. Thank you also to all the people all over the world who sponsor our children and staff and who make donations for particular aspects of the project like the kitchen or the feeding programme. I wish you all, our very generous friends and supporters, peace and love in your lives.